The voice assistant battle is hotting up between the major players; Amazon, Google, Apple, Microsoft and Samsung as they invest to build out their AI-powered voice ecosystems. 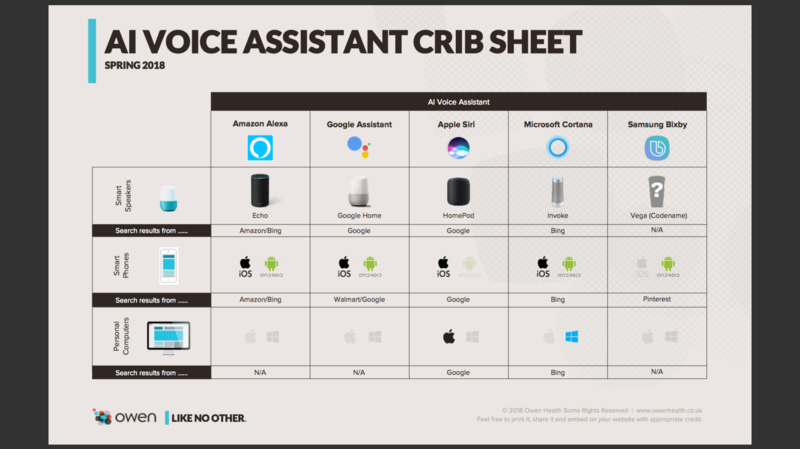 For our crib sheet, we have concentrated on the voice assistant providers, identifying device availability and which search engine powers them, to provide a high-level overview of the current state of play. We have focused on where the voice assistant is either built directly into the device’s operating system or where there is a dedicated native app provided by the voice assistant’s owner via an app store. We have excluded third-party apps, hacks and workarounds.It will be intriguing to watch things unfold over the next 12 months as the AI gets more sophisticated and channel availability expands through strategic relationships.